The new Hawkeye Rigid Video Borescopes offer the convenience and image quality of video, built right into the scope! No more straining to look through an eyepiece all day long. When used with our Portable Video Monitor, or a computer, image and video capture is as easy as the touch of a button. These scopes have all the features and excellent optical quality of Hawkeye Pro Rigid Borescopes, including patented e2 endoGRINs lenses, delivering bright, crisp, clear images. Hawkeye Rigid Video Borescopes can be used with our convenient, hand-held, battery operated, Portable Video Monitor (PVM). The PVM delivers great image quality displayed on a 3.5" TFT LCD screen. The simple touch of a button captures either 640 x 480 JPEG still images, or Windows Media ASF 320 x 240 video footage, onto an SD Memory card. The PVM has a video line-out, allowing you to view images on a larger video monitor. There is also a USB-out for downloading images to an external storage device. Each PVM comes with a battery charger/power supply, video-in cable, video-out cable, USB cable, SD Memory card, and tripod stand. You can easily use Hawkeye Rigid Video Borescopes with your laptop or desktop computer. Just plug the camera output into our VC-USB2 device, complete with Video Toolbox software, and connect the USB directly to your computer. This allows you to capture, annotate, store, and email your images. 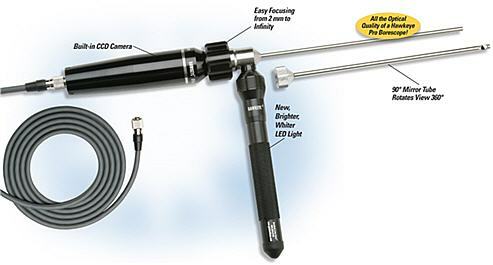 The Hawkeye Rigid Video Borescopes can be used with any video monitor. This is the perfect solution for quick and easy inspection in a Quality Control environment, when you don't need to save the images, you just need to inspect a lot of parts.